Intro: Rarity places her new dress designs on display at Canterlot Carousel, inspired by fictional detective Shadow Spade, but the displays are knocked over by the force of Rainbow Dash bursting into the shop. Act 1: Dash is in Canterlot as a reserve flyer for a Wonderbolts performance. She and Rarity meet retired WB hero Wind Rider at a banquet, and the next day Spitfire is absent, called away by a forged letter claiming her mother is sick. Wind Rider suggests Dash faked the letter to take Spitfire's spot in the show. Act 2: Soarin says Dash can fly in the show if she can prove who sent the forged letter (with the alternative being permanent expulsion), and Rarity offers to help investigate. They check Spitfire's bedroom and the letter, question the guards, and track down the source of a cake delivered to the guards, before returning. Rarity names Wind Rider as the culprit. Act 3: Rarity recounts the crime based on her evidence, and Wind Rider confesses without remorse. Dash retrieves Spitfire in time for the show and ends up flying in Wind Rider's place. Character: Three aspects of Rarity's personality make her especially suitable for the role of a film noir detective: (1) Her attention to detail, which is the key to her solving the case, (2) her offbeat imagination, which I had expected would supply her narration with the absurd figures of speech I usually encounter in film noir parodies, and (3) her flair for the dramatic, which allows her to blend the roles of hard-boiled detective and filly fatale. Rarity's secondary motivation of showing off her new clothing designs works for her character and is borne out for the viewer with some fascinating outfits, my favorite of which is the one we see at the cake shop. At first glance, you might think Rainbow Dash is miscast as the distressed damsel, but not when you consider how many of Rainbow's previous bouts with anxiety have to do either with the Wonderbolts or other hero issues. The fact that Rarity's accusation of Wind Rider makes her upset instead of relieved makes sense when you consider her past experiences of disillusionment and recall that Wind Rider probably would have been in his prime as a Wonderbolt, possibly Wonderbolt captain, when Rainbow Dash was a filly. The impatience born of her stress is understandable, since her dream is at stake, and it also ties into the story's moral about trust. I especially like her brief freak-out after the questioning of the guards, where she begins to doubt her own innocence. Aside from such moments of desperation, Rarity and Rainbow get along like good friends here, without the tension and occasional power struggles we've seen both of them have with Applejack. They've seldom been paired up on the show, despite the story potential of their nearly opposite temperaments. I think they're delightful together here, showing maturity in that neither gets perturbed by the other's differences (although there is a limit) and they really seem to enjoy spending time together. One shining example is Rarity letting Dash have her moment celebrating her first opportunity to fly in the show. Commonly in mystery stories, the most recognizable guest actor is the one who did it. That's not necessarily by design; just that a big-name star may only agree to be part of the project if they get a central role, and it's always neat seeing a typical good guy be the villain for once. Within the MLP universe, Wind Rider is just that sort of celebrity, and we get a little hint of his character early on, when his smile briefly disappears at the mention of Dash as a potential rival. Kudos to the creative team for giving him the look, feel, and voice of a former legend; I definitely buy the idea that he has a history. Speaking of which, don't miss the implication that Wind Rider has done frame-ups like this before, present in a couple lines of dialogue, as well as his obvious comfort with what he's done. 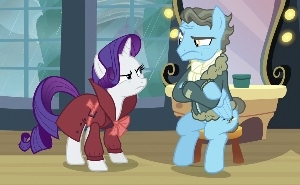 Giving him the same coat color as Rainbow Dash sells the scene where he buys the cake in a partial disguise. I'm not quite sure what to make of the overtly female muzzle in the cake flashback, though. That could just be illustrating Rarity's summation. But of course it also opens the door for viewers to imagine Wind Rider might have had an accomplice. It seems the Wonderbolts can't get an episode without moral ambiguity. At Wind Rider's mere speculation, they're awfully quick to turn accusingly toward Rainbow Dash. Soarin, at least, should remember Dash's integrity and resolve from the end of Rainbow Falls, and her brief resignation from the academy and her actions saving the kingdom are matters of record. All the planted evidence only turns up in the investigation. I will say that suspending her from flying in Spitfire's place until they find some answers makes sense. But putting the burden of proof entirely on her and threatening to ban her permanently is an injustice. Surely there would at least be some disciplinary process; even kids's shows have hearings and trials. Also, any final decision would be made not by Soarin but by Spitfire as captain. And if Spitfire recused herself, she may still have vital testimony, so no action could be taken until she returned. It might have been better story-wise for Soarin to summon the whole team, announce the scandal and the consequences for whoever might be guilty, and ask anyone to bring forward evidence before showtime or nopony flies. A single piece of evidence pointing Dash's way would be enough to motivate Dash's side of the story and leave the Wonderbolts cautious but not overly suspicious. All that's to say, I find a little fault with this part of the story because it makes the Wonderbolts look unnecessarily unfriendly and disorganized. Lesson: Unwilling to get Dash's hopes up until she's sure, Rarity keeps the evidence to herself. But her lines of reasoning, all being based on seemingly irrelevant "Rarity-type" things, give Rainbow Dash fits. All the conventional questions point to Dash's guilt, but Rarity's quiet work vindicates her more and more every step of the way. All Rarity can say, though, is, "I need you to trust me." And that's our lesson. Your real friends, the ones you know care about you, still have their quirks and their own characteristic style. But they're not likely to be playing games with you in the midst of a genuine crisis. I've argued in the past that even Pinkie's random digressions in the direst moments serve to relieve tension and provide the hope of joy that allows her friends to focus past their anxieties. So here, the keen eye, meticulous judgment, and quick reasoning that drive Rarity's fashion passion are the very things that will exonerate her friend. Also, I'm glad we get a good heartfelt apology from Dash to really make the point for any who missed it along the way. One other thing I'll note is the amount of hard work Rarity demonstrates here, as with her sewing and Sassy in her planning last week. In fact, this is the fifth episode in a row where part of the lesson is how far a character is willing to go to accomplish a goal. Our society would have fewer problems if more of us demontrated physical and mental diligence, and the determination to actually do good rather than simply be in favor of good ideas. The people who make these shows for a living know the dignity of toil, and I'm grateful that they're passing that virtue along in these stories. Resonance: I love seeing Rarity's enthusiasm each time she begins fitting a new piece into the puzzle, as well as her and Sassy still getting along. The shifts to black-and-white and back are well-timed and help create the desired atmosphere. I really think this holds its own with live-action comic takes on the genre. And yes, this is a very light-hearted story, so the focus is on the funny. Rarity's overall mannerisms and narration were fun in their eccentricity, but I think they could have done more here. As things stand, most of the effective humor is in the animation. We get some great faces from Dash and Rarity, especially early on in the investigation. I chuckle at Dash very naturally kicking her legs on Spitfire's bed, and there's a hilarious little dance Rarity does to move from one pose to another during the summation. The Sherlock cameos are nice, too. Overall, I'd describe the viewing experience as pleasant, but mild, especially compared to Twilight and Pinkie's mystery episode. Perhaps that's to allow us to focus better on the facts of the case, but it may leave this episode with fewer "moments" and therefore less memorable. Other Impressions and Final Assessment: Besides the friendliness of the early Rainbow/Rarity interactions, this episode's strongest element is the Fair Play Whodunnit we're given during the investigation sequence. The clues aren't pointed out to us, but they're right there for the viewer to notice. Even Rarity's sniffing at the letter mirrors her smelling Wind Rider's cologne a few scenes earlier. But nor is Wind Rider's guilt so obvious that we ignore other potential suspects. Among those I contemplated myself or heard others suggest: Rainbow Dash for real, Spitfire, Soarin, Fleetfoot, Lightning Dust, and even Rarity. Surprisingly, the actual investigation takes only a little over five minutes, the middle of the second act. But the pacing never felt off to me; the structure allows us plenty of time to meet Wind Rider and to see what good friends Rainbow and Rarity are and how much Rarity cares about her client-to-be, and to set up Dash's hopes of flying, making her a credible suspect, at least from the Wonderbolts' perspective. We also get a lengthy summation and aftermath, with the retrieval of Spitfire acting as a coda to the story. Friendship Is Magic sometimes rushes its resolutions, so I'm glad to see a more lengthy cool-down here. Come to think of it, the main writers' other episode, Castle Sweet Castle, took a good two minutes plus to close out that story as well, so this may just be a strength particular to their writing style. I always enjoy the subtleties and hidden treasures in these episodes. One I'll point out here is the scene where Blaze and Misty Fly return; we see Soarin eating a pie and Wind Rider comforting Stormy Blaze. The shot also keeps continuity by showing rain falling outside the window. 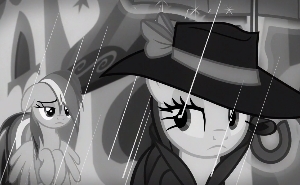 It also sets up a genre-appropriate thunder underline on Rarity's entrance. Overall, this is a very good episode, a bit light, but light isn't bad in my opinion, especially as dramatic and actiony as this season has been. However, the story's portrayal of the Wonderbolts and their treatment of Rainbow Dash are a bit questionable on the character and logic counts I discussed earlier. These moderate concerns bring it down below Simple Ways and Read It and Weep, but the characters' maturity and the overall entertainment value place it above Suited for Success and Rainbow Falls. 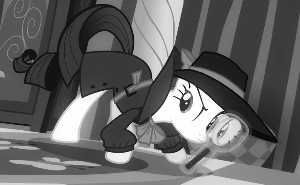 So I rank Rarity Investigates! around the middle of the pack.